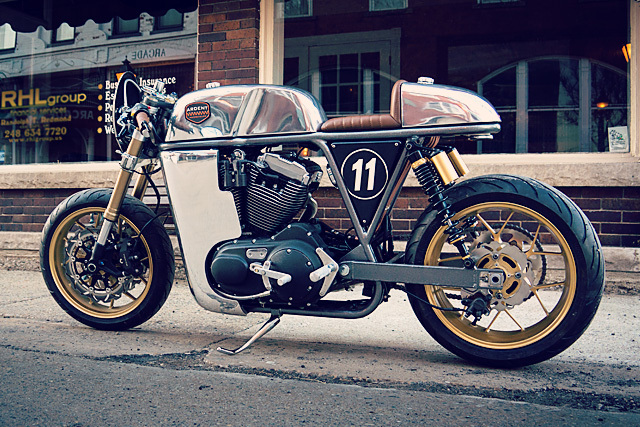 A Renaissance man can do it all, and Curtis Miller from Ardent Motorcycles in Milford, Michigan is practically Da Vinci with a thumping V-Twin between his legs. Forget about riding bikes as a kid, Curtis didn’t own a motorcycle until he was 56 years old but once he’d thrown his leg over a Harley Sportster and hit the road he was hooked and began to discover a new art form. Which is exactly what he has always done, a holder of a Bachelor of Fine Arts he’s been self-employed his whole life, first building furniture, then as a computer animator and a photographer but along the way he’s also built everything from classical guitars to a wooden kayak and even radio controlled gliders. 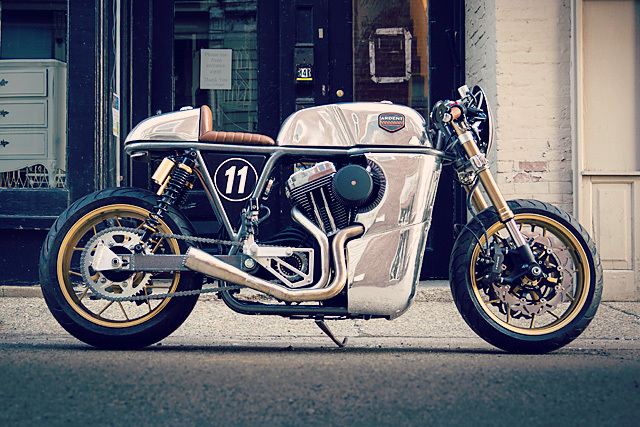 So when the motorcycle bug hit it was only a matter of time before Curtis was building them from scratch and this hand-built machine known as “The Grand Prix” powered by a 2009 Sportster engine is his latest creation. Nearing retirement age before buying and building bikes this was no mid-life crisis for Curtis but the logical next step for an artist who can do it all. 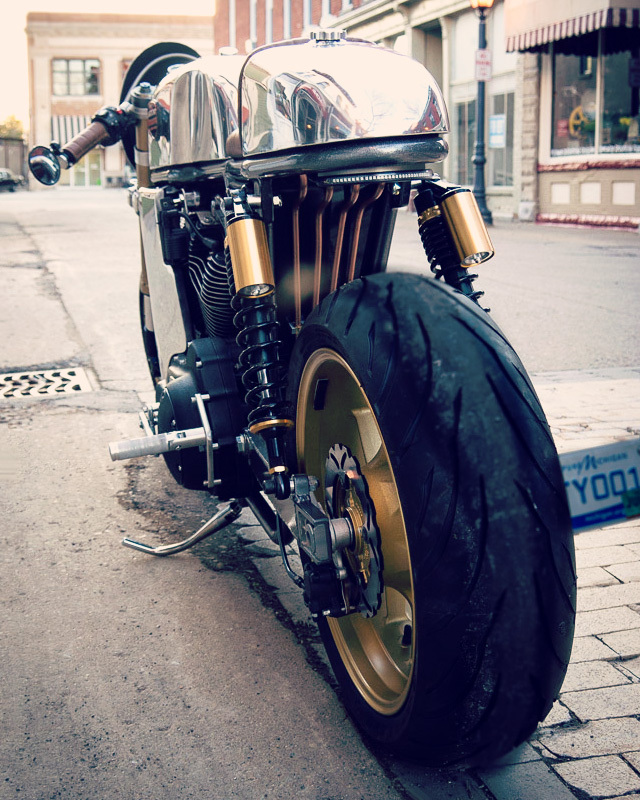 “I was reading everything about motorcycles that I could get my hands on. The exhibition catalogue from the famous Guggenheim Museum show The Art of the Motorcycle was a big influence, as was the book The Art of the Racing Motorcycle. It was a particular influence on the Grand Prix build.” He enrolled in community college to learn the finer points of frame building and metal shaping, got his mechanics license, taught himself to weld and is now completing an advanced program in engine building… way to makes us all feel lazy and inferior! 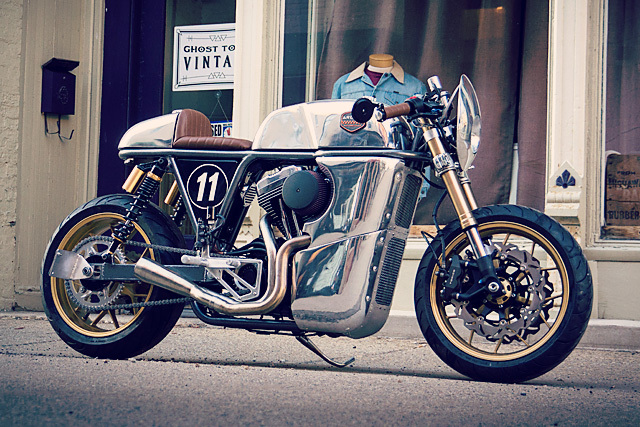 From his workshop, a converted two car garage, The Grand Prix is his second Cafe styled build and a working example of everything he has learnt so far. An artist might like to start with a blank canvas but Curtis thought he better build that too and the frame is entirely his own creation. 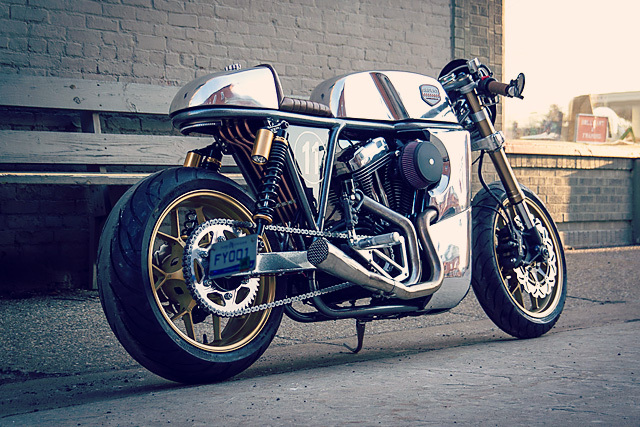 Based on the rough design of a Norton Featherbed but suited to take the modern Sportster’s engine. Even on the jig the bare frame is a thing of beauty, incredible welds that defy their creators minimal experience and a precision that a renaissance man requires of himself. Anywhere that needed just a touch of filler was applied the old school way with silicon bronze and all the welds have been ground down for a perfect finish. To give the frame a little something more it’s all been painted by the man himself in a metallic grey with heavy metal flake to really pop against the raw alloy body. With the frame complete work could begin on the metal body work that is inspired by the small capacity GP bikes of the ’60s and shaped by hand exclusively by Curtis himself. The tank for example is made up of nine separate pieces that took three days of shaping with a mallet, sand bag and English wheel before they could be welded together and a further five days of smoothing it all off to have it ready to sand and polish. One area of change on this tank as opposed to the previous Cafe Racer version Curtis created is the addition of knee cut outs as he felt the previous version was too wide in this area. This extends back to the hand-made seat that is narrower at the front for a more tucked in and comfortable riding position. The seat itself is generously padded without taking away from the stripped down racer look and neatly stitched brown leather works perfectly with the alloy as another natural raw material. 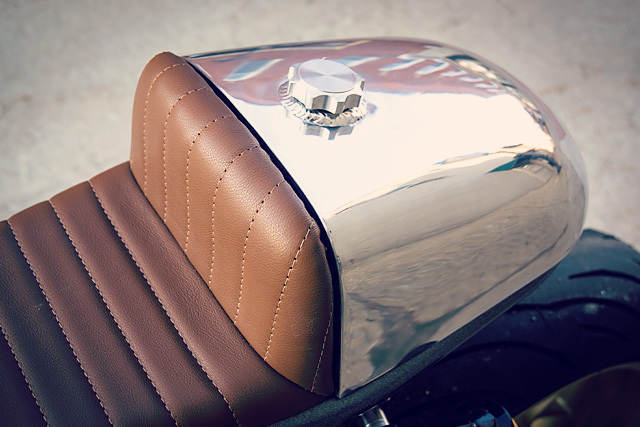 The tail section is more of Curtis’s fine work and not only is it hand shaped in perfect dimension it also doubles as an oil tank with neat copper lines running underneath to deliver the Harley lump a constant supply. The next step was the fairing, a tank and seat is one thing but hand forming such an unusual piece is a serious challenge to pull off with form and function having to be absolutely perfect. “The finishing is the hardest part. Getting the aluminium smooth enough to polish without a lot of bumps and waves is very challenging”. But not only does it look incredible, the body work that shields precisely half of the Harley V-Twin also supplies ample air flow to keep everything cool. This is achieved with two large vents at the front and the flowing lines of the body work that wrap their way around the air filter and exhaust. The engine itself is a 2009 fuel injected Sportster unit bought from a salvage yard off eBay at the start of the build. Curtis pulled the engine down and gave the top end a rebuild with the valves and seats being dressed while the cylinders have been honed and a new set of rings and gaskets ensure the whole thing seals up to factory specs. The new filter gives a sweet induction roar but nothing sounds as good to any motorcycle rider than the sweet harmony of hand-made pipes and this classic 2 into 1 system is an incredible example of just how far one man’s skills can come in such a short period of time. To hide all the electrical components away there is a custom box under the seat and is neatly hidden behind the two black painted side panels wearing the number 11. With plenty of companies offering swingarms for any frame you can possibly imagine it would have been easy for Curtis to get online and have one sent in over night. But why buy what you can build and just like the frame this unit is incredible, with shock mounts built-in and finished in the same heavy flake paint work. The rear end is just what you would expect from a race inspired machine with twin adjustable shocks fitted with remote reservoirs, while a Honda CBR1000RR rear caliper is under-slung like a modern race bike for quick wheel changes and clamps a wave pattern rotor. The front end is one of the few major components that isn’t bespoke and came from a Suzuki GSXR600 with two large wave rotors working in conjunction with Tokico calipers from the Suzuki. Did I mention Curtis is also handy with a mill? Crafting the one-off rearsets and associated componentry as well as an industrial look sprocket cover to match. 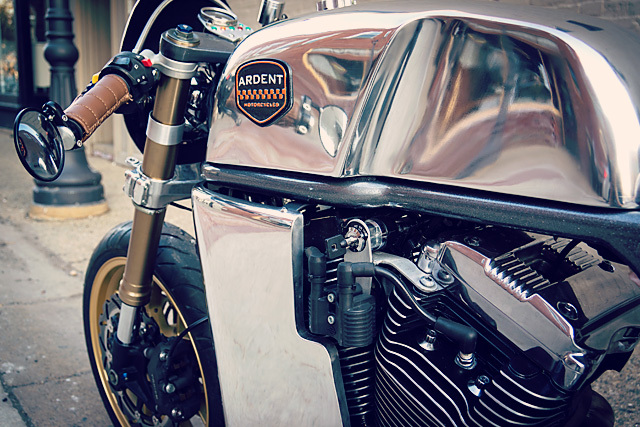 With a build this good accessories are kept to a minimum, the clip-ons wear seat matching brown leather grips and bar end mirrors. While a single instrument and idiot lights in a custom housing give all the information that Curtis needs with the rest coming straight through the seat of his pants. 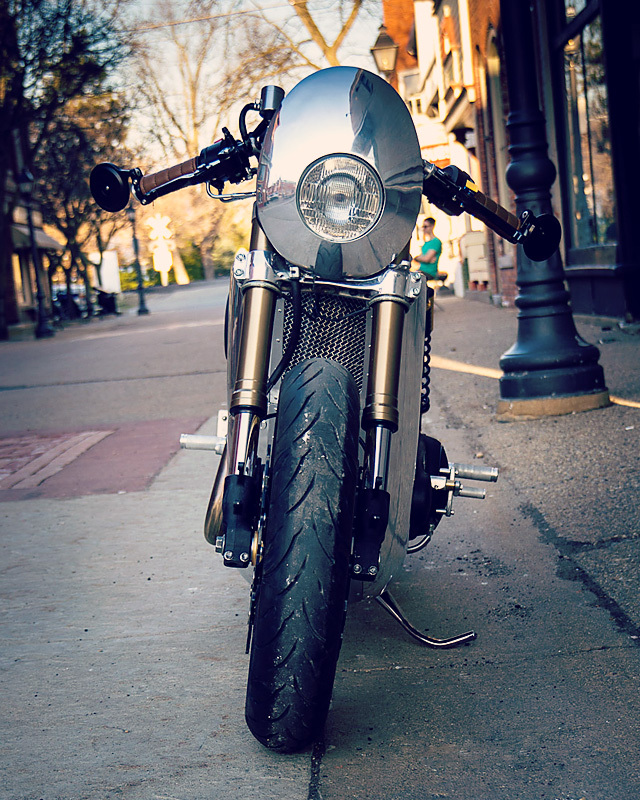 The small headlight wears a fairing that is much more shield than bikini and the hand formed metal work surges forward with the bike like a warrior going into battle! It’s all finished out with barely visible until illuminated LEDs front and rear and a set of Ardent badges so you know just who is responsible for this machine. Apart from a few visits by the neighbour to hold things in place for welding absolutely everything is done by Curtis himself. 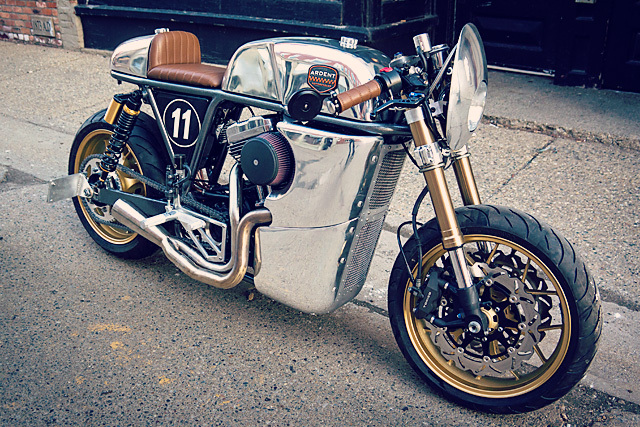 “The Grand Prix” is now for sale but this self-employed renaissance man has found an all new art form to express himself and Ardent Motorcycles is set to exhibit again very soon and with the speed in which Curtis learns the craft it’s frightening to think of just what’s next!